How To Make: Shampoo For Little Humans..
Hi guys! We have another shampoo recipe to share with you today. This one is our in-house favourite. Maybe its the coconut oil effect that everyone loves? Its so easy to make mainly because, who doesn't have coconut oil at home? 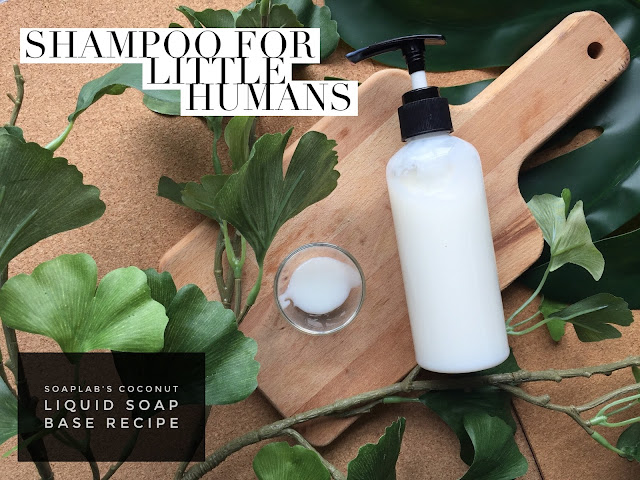 The name suggests that this shampoo is to be use for babies, but since there are only natural ingredients and nothing more, this shampoo is actually suitable for all ages, including babies. We use our SoapLab liquid shampoo base to begin with. For this recipe, we've chosen coconut oil. Usually we use oils as a conditioner before shower, which you should continue to use of course... the reason we are also adding it into our shampoo is for extra nourishment. As our hair tends to get weaker after washing and more prone to breakage when wet, having oils in your shampoo really helps to prevent this. Coconut oil is one of the only oils known to strengthen and increase the protein content in your hair which is why we are using this oil here. If your hair is prone to breakage, this shampoo is perfect for you! The fragrance we have chosen is Baby Clean for a light floral and fresh scent. Can we use fragrance oil in baby products? Yes! We dont use essential oils for babies that are 1 year and below so alternatively we use fragrance oil. Click here to read why. Plus, we add in Vitamin E which is known to encourage hair growth and is very commonly used in high end hair care products.